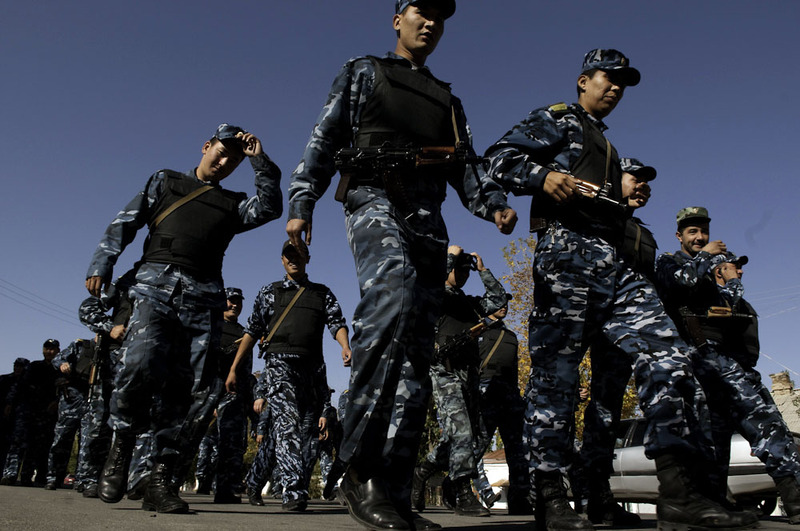 Armed troops arrive to protect the Osh regional administration building prior to the rally by supporters of Butun Kyrgyzstan. 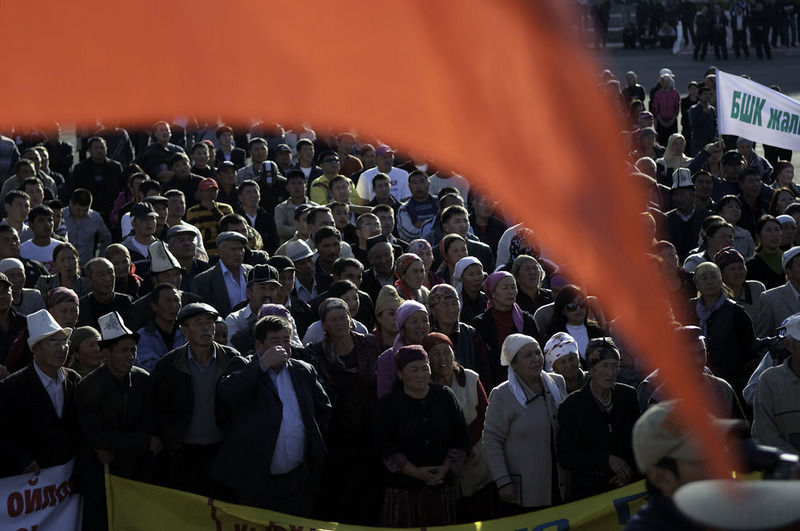 About 200 supporters of Butun Kyrgyzstan (United Kyrgyzstan) attend the rally at a square in central Osh. 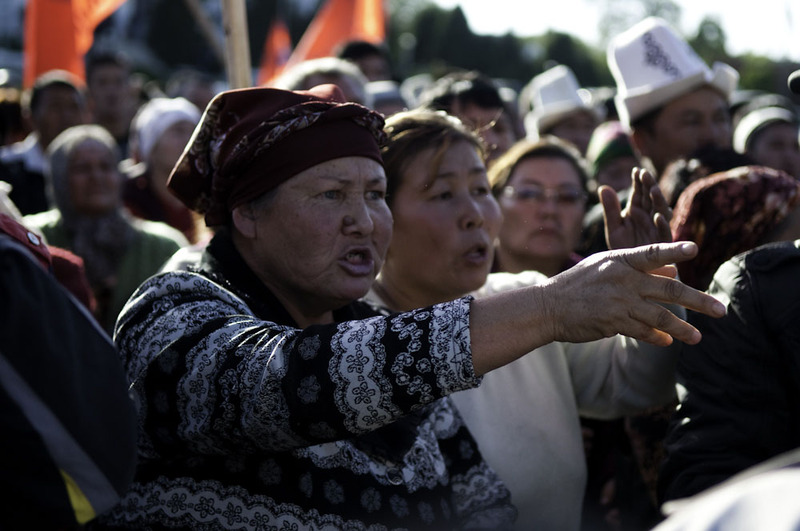 A woman yells at Osh regional Governor Sooronbay Jeyenbekov as he tries to address the crowd. Supporters wave party flags during the rally. 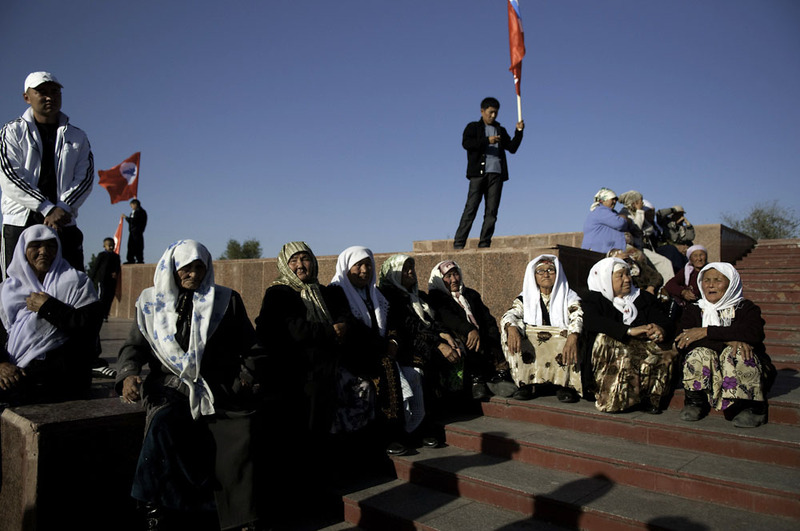 Elderly women sit on the steps near the Lenin statue in Osh and listen to speakers. Members of the Osh volunteer community security service arrive to keep the rally peaceful. 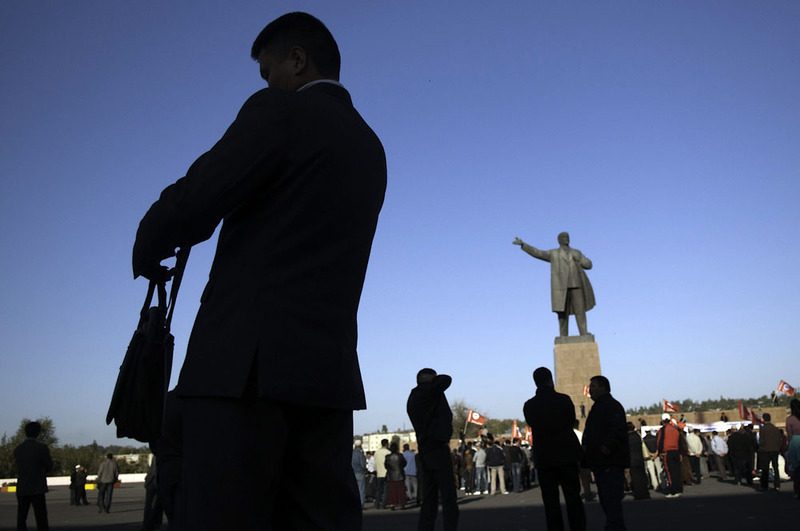 A young boy waves a party flag on the base of the Lenin statue in Osh. 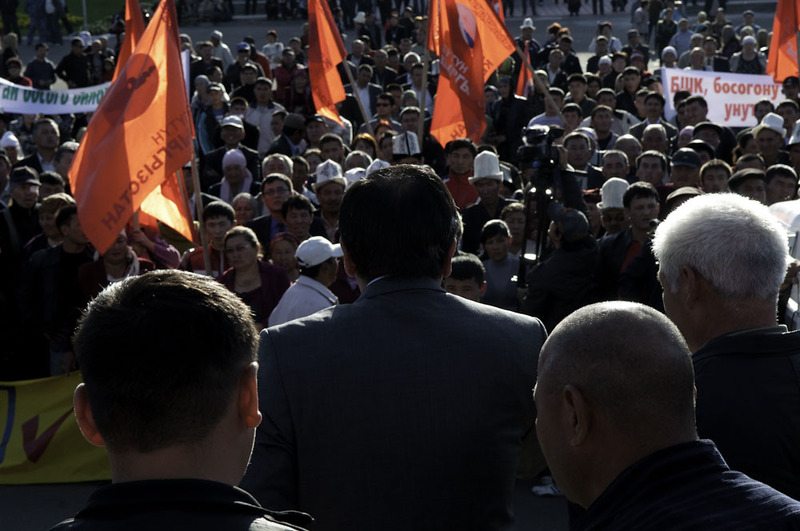 Osh regional Governor Sooronbay Jeyenbekov talks to supporters of Butun Kyrgyzstan. While people scuffle for the microphone at the rally a man tries to get the crowd excited with screams of "Butun Kyrgyzstan!" Supporters of Butun Kyrgyzstan listen to speakers address the rally. 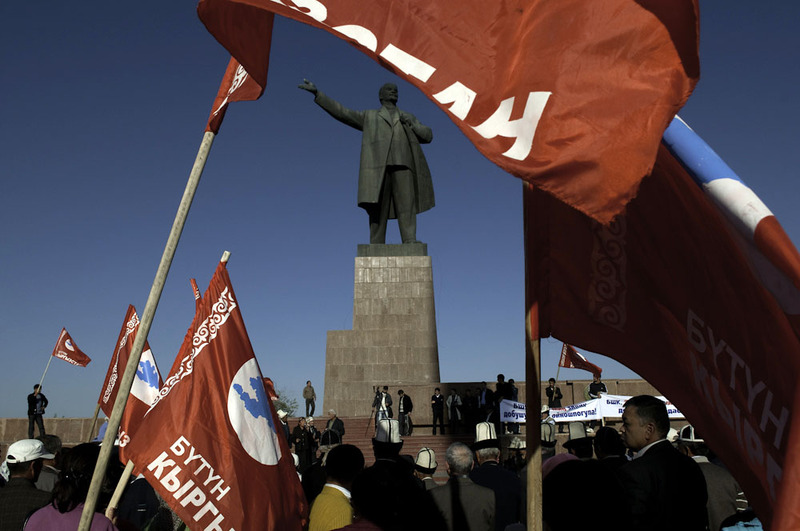 The Osh rally was held on the main square between the Soviet-era Lenin statue and the Osh regional administration building. 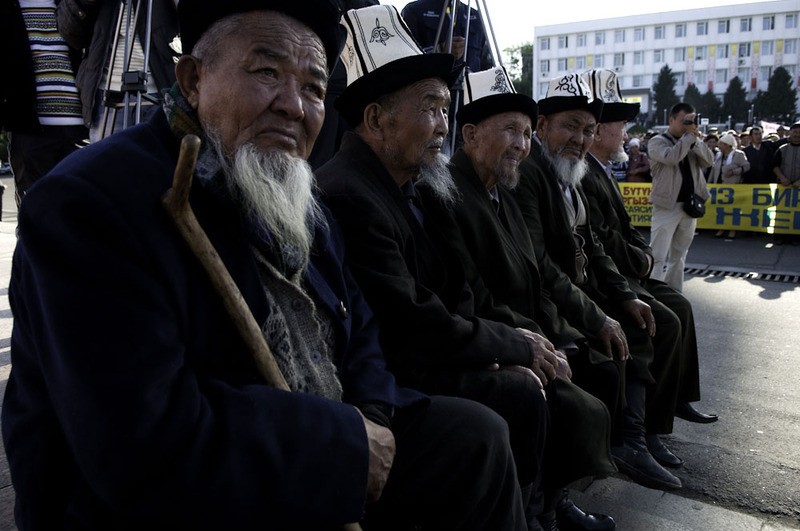 Kyrgyz elders listen to speakers address the rally. A man checks his briefcase near the end of the rally, before departing with others. 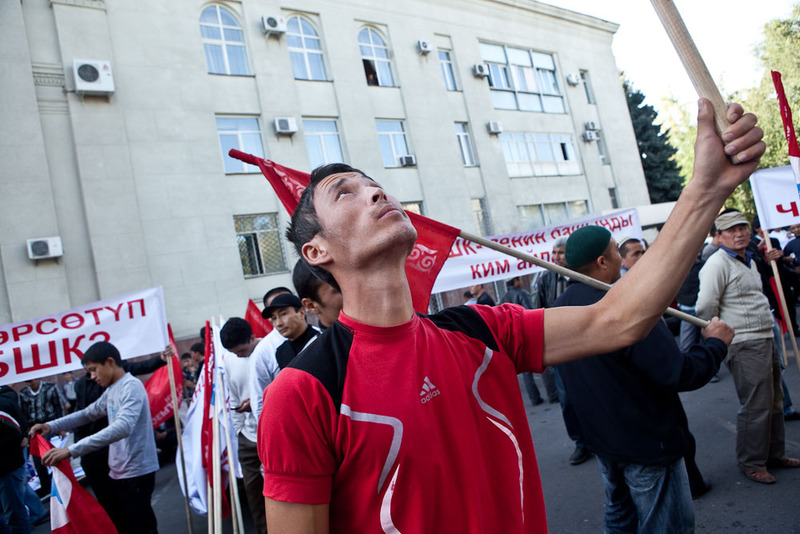 A man tries to calm down shouting protesters outside the Central Elections Commission (CEC) offices in Bishkek. 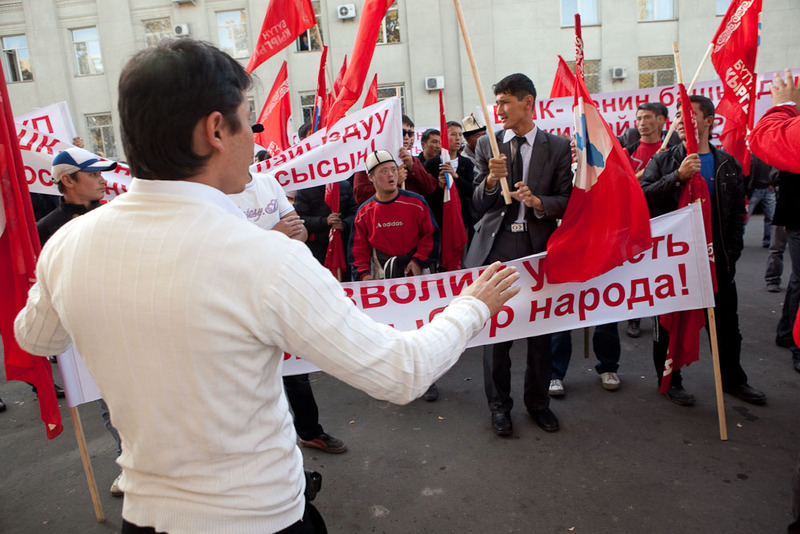 CEC head Akylbek Sariev speaks to pro-Butun Kyrgyzstan protesters, before returning to his office with rally leaders. 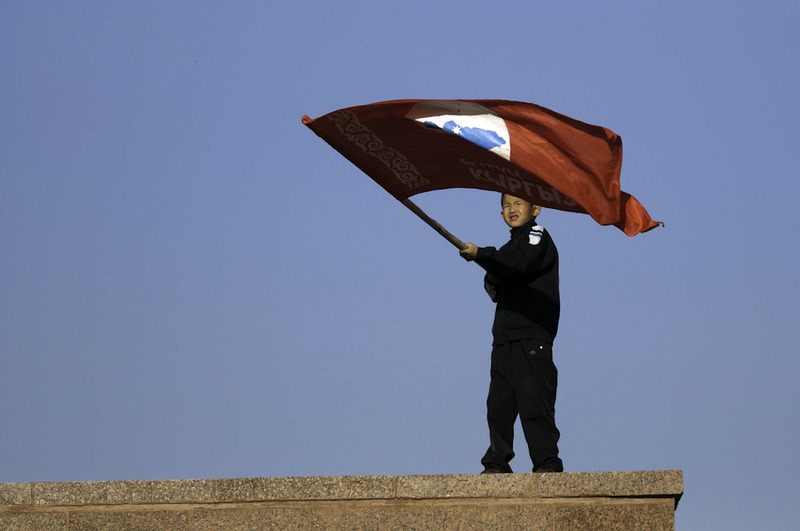 A protester hoists a Butun Kyrgyzstan flag outside the CEC offices in Bishkek. 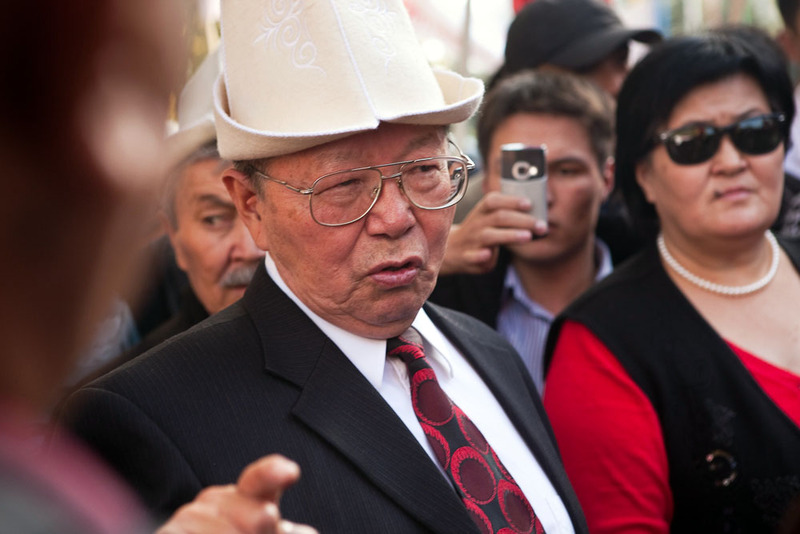 Topchubek Turgunaliev, an advisor to the president on political issues, speaks with Butun Kyrgyzstan protesters in Bishkek. 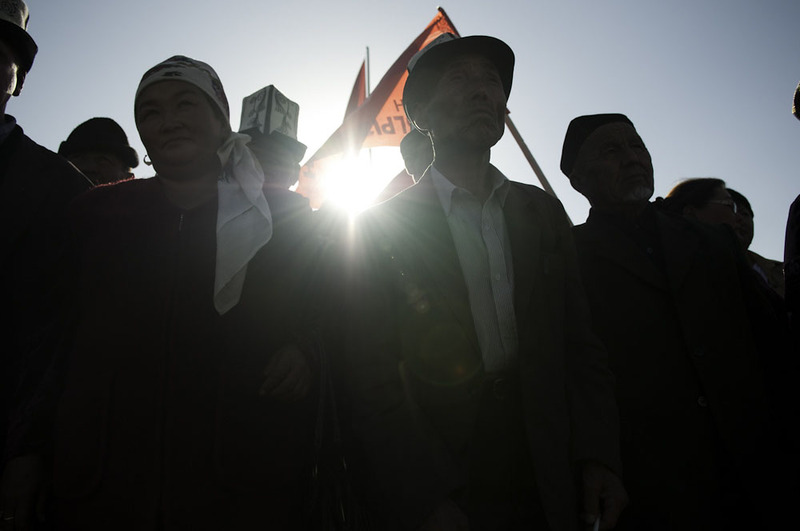 Kyrgyzstan's experiment with pluralistic democratic rule faltered on October 12 when one party that narrowly missed getting into parliament questioned the results of the October 10 elections. The controversy threatens to undermine Kyrgyzstan's attempts to break Central Asia's autocratic political mould and has angered party supporters in the restive southern regions, threatening to unleash another round of destabilizing protests as the winners try to form a stable coalition government. 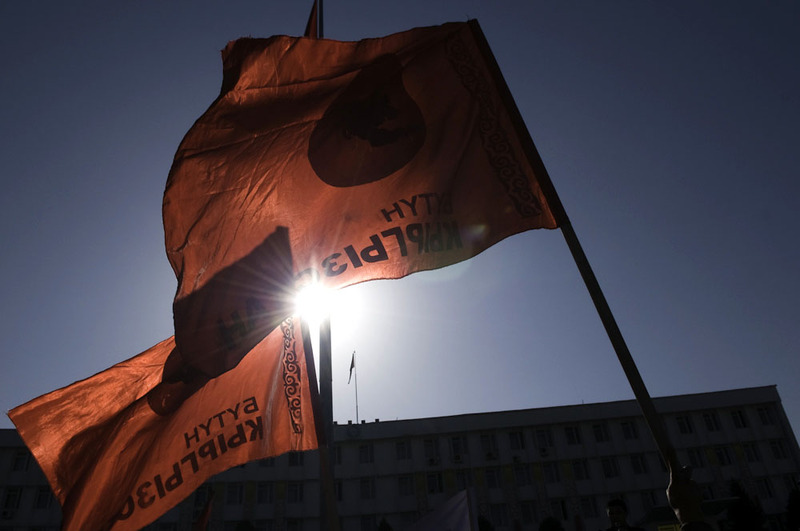 The nationalist Butun Kyrgyzstan (United Kyrgyzstan) party claims that electoral officials “playing with the figures” have deprived them of a voice in parliament. 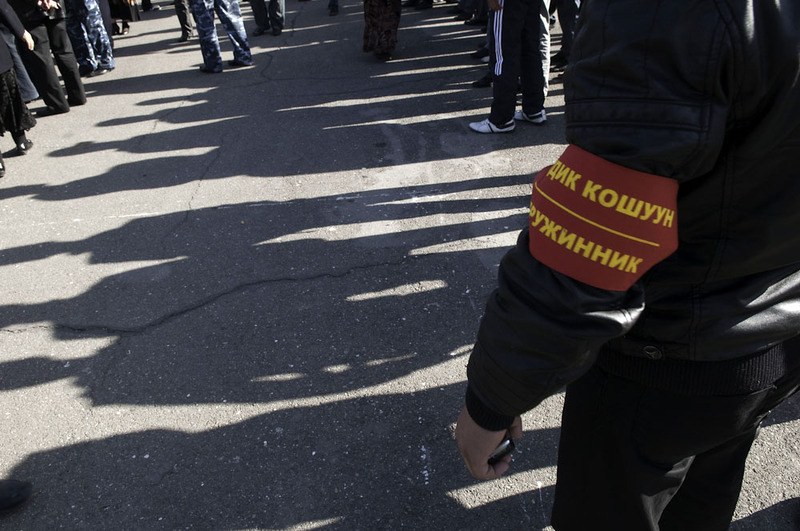 Many supporters – who took to the streets in Bishkek and the southern city of Osh, the party’s political heartland – believe the manipulation was deliberate. The row hinges on the number of votes parties needed to take parliamentary seats. The national threshold is 5 percent of the total electorate. Before the election the Central Electoral Commission (CEC) said there were 2.8 million voters and the number of votes required was 141,828. 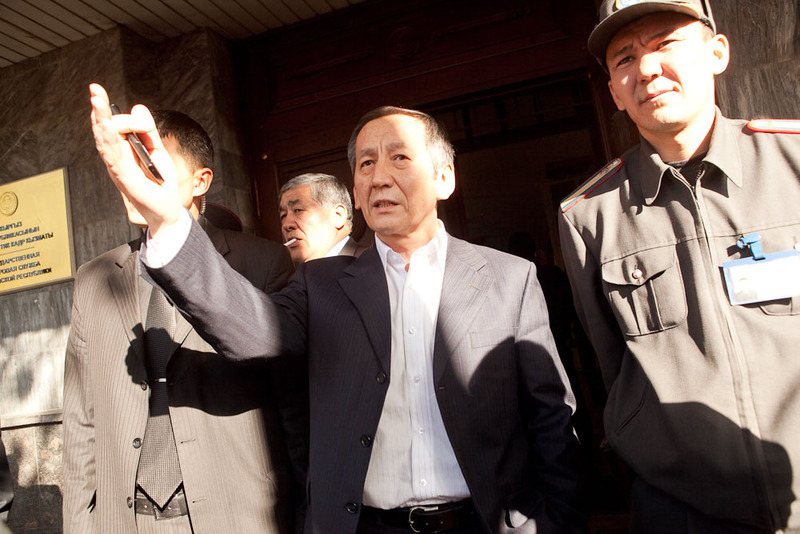 When election results came in on October 11, the CEC put Butun Kyrgyzstan’s share at 4.84 percent, leaving it outside parliament – but it transpired that the party had won 145,455 votes. On October 12 the CEC explained the discrepancy: it said the electorate was actually 3 million, not 2.8 million, so the number of votes required had shot up to 150,000. The CEC rejects the charge – though it has not clearly explained how the discrepancy occurred – and says the automated electoral system, which is called Shayloo (Election), cannot lie. “Butun Kyrgyzstan can say what it wants, but according to the data of the Shayloo system, this party did not overcome the 5 percent barrier,” CEC Chairman Akylbek Sariev told a press conference on October 12. 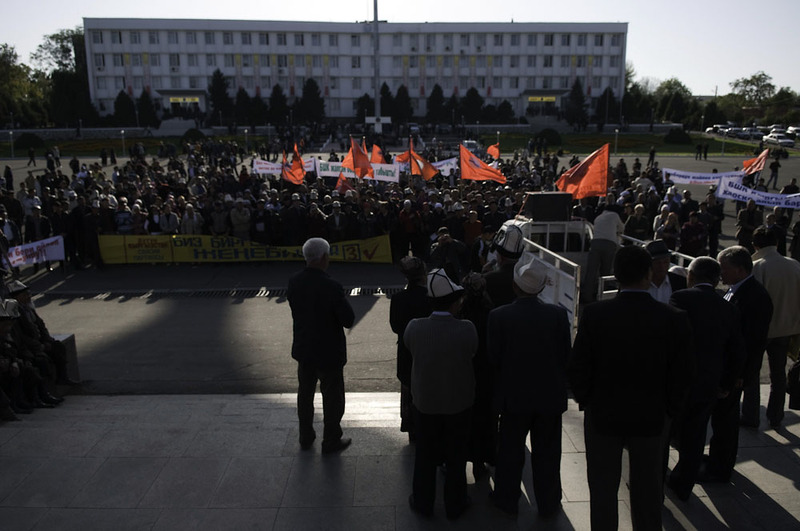 Around 200 protesters attended the Osh protest, waving banners reading, “The CEC of Kyrgyzstan is bringing chaos!” Simultaneously, some 150 protesters gathered outside the CEC headquarters in Bishkek. 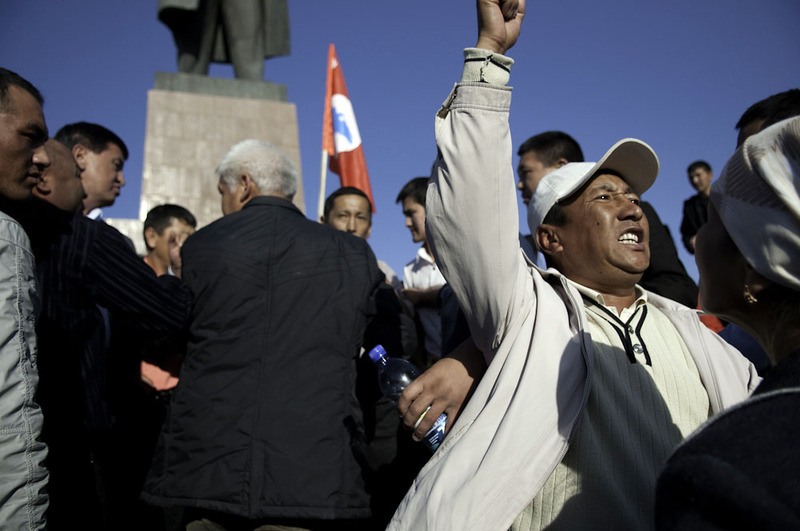 Osh Region governor Sooronbay Jeyenbekov emerged from his office to appease protesters and urge them to rally peacefully. They greeted him with heckling but allowed him to speak and heeded his call. Bearing in mind the need to preserve that fragile peace, the provisional government now faces the challenge of diffusing the row before it escalates. Reporting from Osh: Joanna Lillis is a freelance writer who specializes in Central Asia and Dean C.K. Cox is the photo editor for EurasiaNet. Reporting from Bishkek: David Trilling is the Central Asia news editor for EurasiaNet.